Due to reasons beyond my control, I recently found myself standing in a large make-up department in need of an eyeshadow in a specific shade. A nearby counter displayed a massive collection of colors – a suitable place to start. I looked up with a smile as the saleslady continued 'All of our eyeshadows are really safe - they're 100% paraben-free'. 'Uhmmm, hmmmmm...' came the flustered reply. 'Why don't you ask over there?' Her hand waved in a non-specific direction that encompassed the entire floor. My husband, who was accompanying me, steered me away. For the record: he doesn't enjoy being in make-up departments. He only offers to accompany me so he can protect salespeople who dish out thumbsuck about cosmetics ingredients from my spontaneous lectures. Unfortunately, my antagonistic devil had taken hold, so I was now on a self-appointed quest for make-up containing parabens. I fell in love. Right then and there. What a delight to meet an informed salesperson! I told her so too. 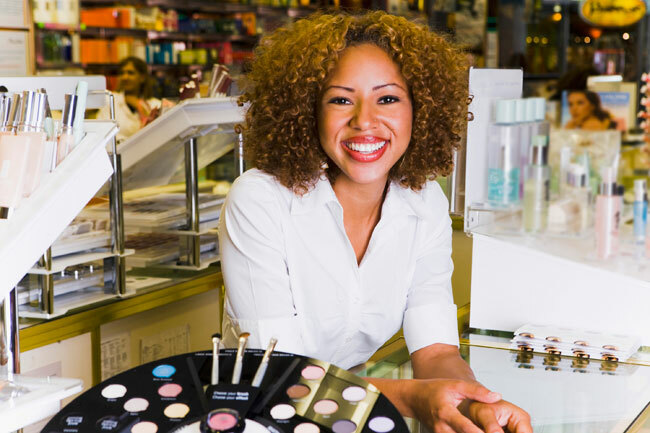 I complimented her on her knowledge and not being afraid to offer it as I followed her around the department from one brand to the next, checking ingredients lists and considering color choices. I told her she was a ray of sunshine - a breath of fresh air - an angel. I don't think she was used to that much praise. Her smile just kept getting bigger and warmer and brighter - kind of like that fabulous looking smile you see above. By the time we left, she was all giggly. There was an unexpected little bonus outcome from this trip to the store. My husband, who was all smiles until he saw the pricetag on the eyeshadow - offered an insightful comment. I'm sure he had mentally tallied up the numerous products on my make-up table before saying, 'No wonder you make all your own make-up. I thought it was just because you like playing around with pigments and powders'. Below: here's what I came home with: a duo-shadow by Elizabeth Arden called 'Black tie'. I've placed it next to a cream-based version of the color I was looking for. It's obviously not spot-on, but it'll do – for now. My work-around: layer of the cream as a base. Thin layer of the powder eyeshadow on top. The black is being tested both as a liner and on my eyebrows. So far, no itching and no irritation. PS: The ingredients list did not include parabens, but did contain ingredients I could tolerate without problem. 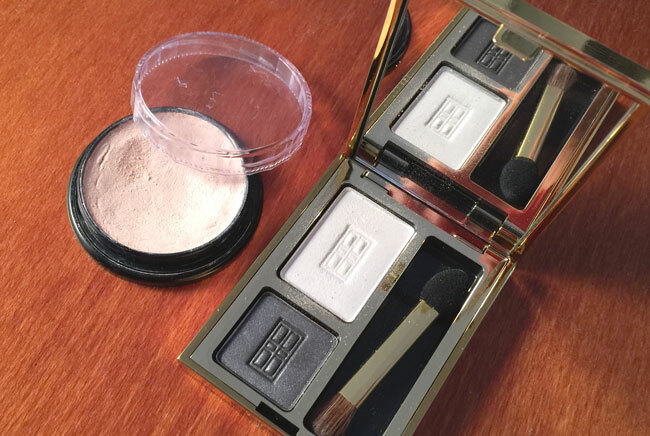 Here's the eyeshadow emergency that led to this post. From the other side as a seller; It is easy to sell paraben-free. People either; 1. don't know about it, 2. think it's irrelevant or 3. really hate it... so paraben-free will sell to all 3 groups. Yourself being a small 4th category. However, is it possible to positively market parabens as a better ingredient? I have been researching marketing capaigns in cosmetics and come up with zilch other than a few pages on some websites explaining preservatives (not really marketing, more explanations). I'm coming to the conclusion it's pointless highlighting it to the first group as it might worry them unnecessarily, the 2nd group don't care and the 3rd group won't be converted thru marketing messages (which is not a good medium to convey a complicated message). So fighting the paraben-free marketing machinery is an uphill struggle. Despite increase in sensitisation and failure with other preservatives. People in the 3rd category are growing as a result of general fear from ingredients that may cause concern. So instead of being converts to parabens because of failure of alternatives, they just add more things to the list of bad chemicals. Thank you for your kind words Andoy - I do realise it is a struggle to educate consumers about ingredients and I also can appreciate the problem manufacturers struggle with - fighting a scare-campaign the media is thriving on is a particularly tough one. Nonetheless, I believe it should be the sworn duty of those 'who know' to enlighten/educate/inform those 'who don't know'. 'IF YOU THINK EDUCATION IS EXPENSIVE; TRY IGNORANCE'. That kind of says it all, don't you think?. I love reading about everyone's adventures at the cosmetic counter, after all it does become quite a feat! Funny you should mention the parabens, I have noticed the makeup I have bought without parabens may be great in the beginning due to texture but they go bad pretty quickly. I notice a rancid smell much more quickly which I didn't have when no one gave a scare about parabens. Hi Olivia - You make an excellent point. Paraben preservatives do have a long and proven record and have been a favourite for make-up in particular. I'm sure if you check the 'use by' date on your make-up without parabens, it is shorter than it used to be. This is one of the prices of using alternative preservatives.